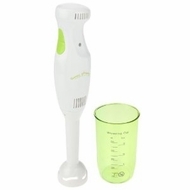 200 Watt plunging mixer Perfect for soups, mashed, sauces, mayonnaises, milk shake, batter, baby food and more. Comes with a mixing cup and a stainless steel blade. Designed of a high temperature resistant material for mixing hot-preparations, dishwasher safe.